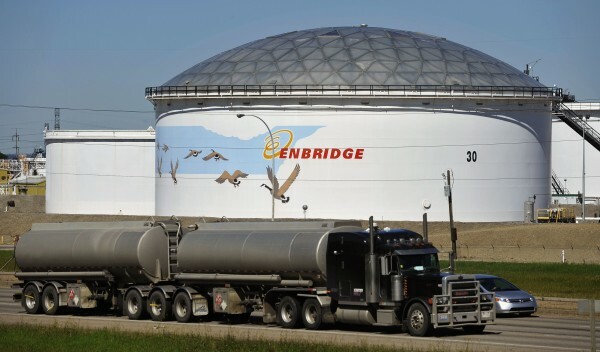 A storage tank looms over a freeway at the Enbridge Edmonton terminal in Edmonton in this, Aug. 4, 2012. PORTLAND, Maine — The California consulting firm Navigant has concluded almost all proposals for using stored natural gas to protect Maine electricity customers from wintertime price spikes won’t be worth it, especially if a major regional pipeline is expanded. With or without a pipeline, the consultants projected a proposal for storage facilities in Brewer or Rumford would not deliver a benefit to electricity ratepayers. If Spectra’s Algonquin pipeline is not expanded through its Access Northeast project, the consultants found that changes the value of natural gas storage to electricity customers, but they were optimistic about Spectra or another pipeline developer’s chances. With the pipeline project, the analysis found that only one storage project would have a net benefit for electricity ratepayers. Without Spectra’s project, it found seven of the projects could have a net benefit. But their forecast favors a scenario where Spectra’s project or another expansion goes forward, making it more difficult to justify charging ratepayers for natural gas storage projects. “Even if Access Northeast is not built, the market will likely respond accordingly with some other project being built, as has historically been the case when the need for additional capacity is indicated by the market,” the report states, adding that incoming Republican president Donald Trump’s administration ” tend to support” the scenario with new or expanded gas pipelines in the region. That’s despite delays in Spectra’s project, which was initially planned to enter service in 2019. Spectra notified federal regulators Dec. 16 that it would delay the $3 billion proposal but expects to have updates later in 2017. The project would expand capacity on Spectra’s line running from eastern Pennsylvania to Massachusetts, where it connects with the Maritimes & Northeast Pipeline, which passes through Maine to the Canadian Maritimes. The storage projects are a mix of proposals for storage tanks in Maine and New Brunswick and for trucking natural gas across the state. The plan would be to tap the storage facilities during times of peak demand for regional pipelines, insulating customers to some degree from electricity price spikes because of gas shortages, which are most acute in the winter when demand for the fuel rises for heating and generating electricity. Just like a pipeline, a storage facility could enter contracts with generators, liquified natural gas exporters or others to supply gas. Under such a deal, power companies would enter contracts with the storage companies to pay for the added natural gas capacity, passing those costs along to ratepayers in electricity bills. An earlier case at the Maine Public Utilities Commission also sought to address that shortage, considering whether ratepayers should help pay to expand regional pipelines. A law approved in early 2016 expanded regulators’ $1.5 billion authority on that front, specifying that if no pipeline projects come through requiring the full amount, the rest could go toward possible storage options. That law maintains an annual cap of $75 million in ratepayer funds going to either pipeline or storage projects, over 20 years, and it caps the total amount that could go to storage plans at $25 million. The fate of Spectra’s project looms over both gas cases, because Maine regulators in July voted to give its Access Northeast project the full $75 million annually. That’s only if other states agree to do the same, and that appears unlikely. The Access Northeast project has faced headwinds getting financial support from other New England states, notably Massachusetts, and that’s a condition for getting the Maine funds. In August, the Massachusetts Supreme Court blocked utilities from charging ratepayers for gas pipeline construction. Still, without those funds, Spectra said the project is moving forward. Regulators are now reviewing bids from six different companies, including the Brewer and Rumford proposals from Northern LNG, proposals for trucking gas from Eagle LNG and storage proposals from Cavus Energy, Engie, Reliable Energy Solutions and Northstar LNG. Many of the specifics of those proposals remain heavily redacted in documents filed with the Maine Public Utilities Commission. In a proposed timeline, Northern LNG said it hopes to secure a contract from regulators by June 2017, close financing and secure permits by August 2018 and begin construction in 2019 for operation in 2021.